High-frequency welding serrated finned tube is serrated the steel fin strip before high-frequency welding, and then use high-frequency current skin effect of high temperature use steel teeth will start after welded to the pipe. 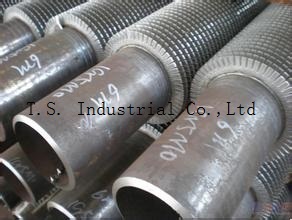 Finned pipe welding process to produce such a high fastness, good heat transfer efficiency. In addition fin spoiler role increase after a tooth to improve the heat transfer efficiency, and better able to prevent fouling. b fins deviation of less than full length ± 10 mm c deviation is less than the number of fins ± 1.5% 2 welded finned tube (1) partially unmelted weld portion is smaller than the length of the finned tube diameter, and less than 50 mm (2) Welding Local seam unmelted quantity per meter pipe length of less than 2 3 pull-off strength ≥196MPa 4 ≥80% fusion rate sawtooth-frequency welding spiral finned tube production line can produce all kinds of carbon steel, low-alloy steel and stainless steel spiral wing sheet tube. (3) production lines composed of zigzag-frequency welding spiral finned tube production line consists of the following components: (1) automatic loading frame; (2) automatic unloading aircraft; (3) high-frequency welding group; (4) Frequency Welding card unit; (5) material storage systems; (6) the strip open tooth systems; (7) water circulation system. The entire system using the PLC system control (4) the implementation of product quality standards product implementation JB / T6512 standards. Quality standard name is "high frequency resistance welding spiral fin tube boiler manufacturing technology conditions"